This article will guide you through to include Instant Team Sessions plug-in into Sametime 8.5.2/9 installer. To get started you will be needing Sametime client installer and Instant Team Sessions plug-in install site. 2. After files have been extracted go into the specified location, folder should contain following files and folders. 3. Next go into “updateSite” folder. 4. Copy “TeamSessionsSite\features\Instant_TeamSessions_1.0.154.jar” from Instant Team Sessions plug-in install site to “updateSite/features” folder. 5. Copy “TeamSessionsSite\plugins\com.ibm.collaboration.realtime.instant.team._ST8_1.0.154.jar” from Instant Team Sessions plug-in install site to “updateSite/plugins” folder. 6. Next open site.xml located in updateSite folder in any text editor. 7. At the end of the file add following nodes under site tag. 9. 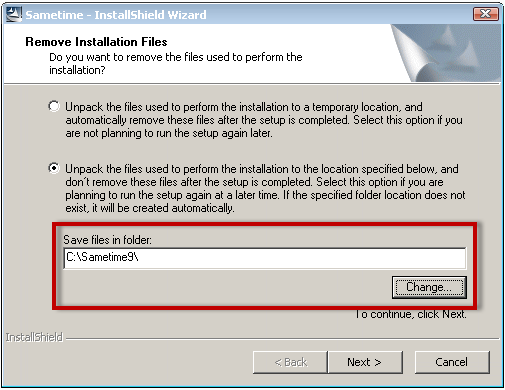 Next the Sametime 9 directory can be packaged back as a self-extractor executable. Self-extractor executable will need to launch the process “setup.exe” after successfully extracting files.